In the Women’s National Road Series race (the Fiona Meade Trophy) only 18 of the 26 starters saw out the 72km in tough wintery conditions. Irish international Mia Griffin won the final sprint from her two breakaway companions. The rider from Glenmore in Kilkenny set a new national Women’s Team Pursuit record earlier this year at the UCI Track Cycling World Championships in Poland, and had finished fourth in the opening round of the NRS 2019 at the Des Hanlon Classic. She beat Ireland’s National Road Race Champion Eve McCrystal, riding for STRATA3/VeloRevolution Racing Team for the first time, and National Time Trial Championships Silver Medallist Eileen Burns – that trio having worked as a breakaway for the majority of the race.Griffin said: “Eve attacked about 10km in and her and Eileen just went really hard, and I thought they’d be good to go with because obviously they are so experienced on the road, they are such strong riders. “I sprinted for about 30 seconds to get over to them, and then we just worked really, really hard together the whole way. It was so windy. Griffin is now second in the Women’s General Classification behind McCrystal’s new team mate Grace Young, who finished fourth in Blarney. 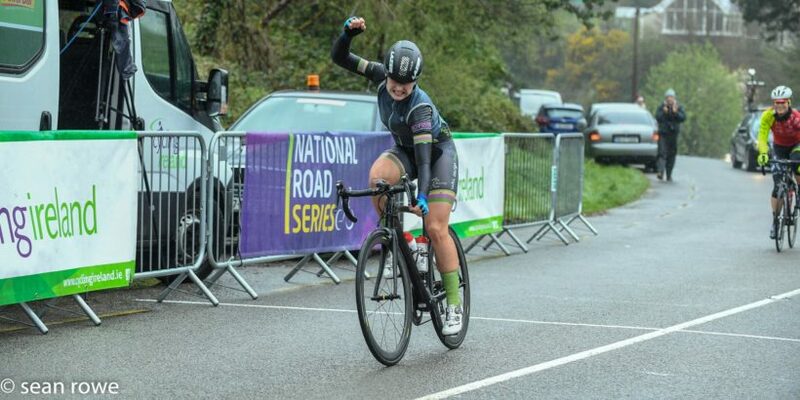 The gap of just four points leaves Griffin wanting more, and further trips to Ireland from her base with the Irish team in Mallorca are on the cards.“My plan for this summer is to do European Games on the track,” she said, “and after getting a taste for these National Road Series races, I love them, so I hope I’ll be home for some of them.”Dublin club Scott Orwell Wheelers took the lead in the Women’s Team Classification, Yvonne Doran, Monica Marconi and Arron Fox all among the 18 finishers.